—Thomas Frank, author of Pity the Billionaire and What’s the Matter With Kansas? 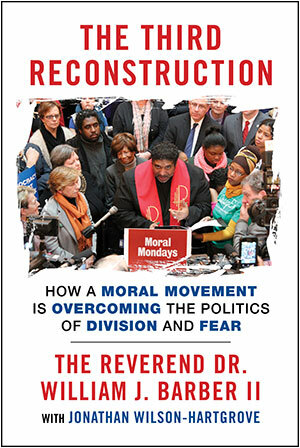 America's Third Reconstruction depends on a moral movement, deeply rooted in the South, emerging state by state throughout the nation. No single leader or organization can orchestrate such a movement, but we who have seen the power of fusion organizing in North Carolina in 2014 established an education center, Repairers of the Breach, to share the lessons of Moral Mondays and invest in equipping leaders for other state-based coalitions. In order to move forward together, we’ve outlined fourteen steps to mobilize in the streets, at the polls, and in the courtroom. Engage in indigenously led grassroots organizing across the state. There is no end run around the relational work of building trust and empowering local people. Crises will bring out crowds and draw attention, but a sustained movement depends on local people who know one another and are committed to working together for the long haul. “Helicopter” leadership by “national leaders” will not sustain a moral movement. Equip and resource small groups of people who will meet regularly in their home communities to talk about the coalition’s concerns. Use moral language to frame and critique public policy, regardless of who is in power. A moral movement claims higher ground in partisan debate by returning public discourse to our deepest moral and constitutional values. Any moral movement must study Scripture and sacred texts as well as state constitutions. We cannot allow so-called conservatives to hijack the powerful language of faith; neither can we let so-called liberals pretend that moral convictions are not at play in public policy debates. Every budget is a moral document—or it is an immoral one. We must reclaim moral language in the public square. Demonstrate a commitment to civil disobedience that follows the steps of nonviolent action and is designed to change the public conversation and consciousness. A moral movement draws power not from its ability to overwhelm opposition but from its willingness to suffer. The Second Reconstruction brought large-scale nonviolent direct action to America through the Montgomery bus boycott. A Third Reconstruction depends upon escalating noncooperation in order to demonstrate our capacity to sacrifice for a better future. Build a stage from which to lift the voices of everyday people impacted by immoral policies. A moral movement must put human faces on injustice and amplify the voice of the voiceless. We do not speak for those who can speak for themselves. We do not create a platform for politicians to speak for those who can speak for themselves. Directly affected people are the best moral witnesses. Our movement exists to let their voices be heard. Recognize the centrality of race. America’s First and Second Reconstructions sought to heal the wound of race-based slavery, America’s original sin. Our Third Reconstruction must likewise be decidedly antiracist. Some will ask, Is the real issue today race or is it class? We answer: Yes, it’s race and class. Our class divisions cannot be understood apart from a society built on white supremacy. Our moral movement must be committed to the long-term work of racial equity. Build a broad, diverse coalition including moral and religious leaders of all faiths. All faith traditions are not the same, but the common ground among faiths is a firm foundation upon which to stand against the divide-and-conquer strategies of extremists. We must be intentional about reaching out to marginalized groups in our states. Though they are a minority in this country, our Muslim sisters and brothers are essential to the Third Reconstruction. Intentionally diversify the movement with the goal of winning unlikely allies. Often the groups most impacted by injustice have been convinced that they are enemies. Fusion politics is about helping those who have suffered injustice and have been divided by extremism to see what we have in common. We do this by bringing people together across dividing lines and helping them hear one another. We have no permanent enemies, only permanent issues, rooted in our deepest moral and constitutional values. Build transformative, long-term coalition relationships rooted in a clear agenda that doesn’t measure success only by electoral outcomes. We must be clear: Fusion coalitions are not about simple transactions where I support your issue if you support mine. We must learn how our issues intersect in a comprehensive moral agenda that demands transformation of everyone—not least, of us. Make a serious commitment to academic and empirical analysis of policy. Nothing is worse than being loud and wrong. Our coalitions must include activist scholars and we must commit ourselves to a serious consideration of data. Moral issues are not impractical. They can be translated into policy that is sustainable and that produces measurable positive outcomes. Coordinate use of all forms of social media: video, text, Twitter, Facebook, and so forth. Mainstream media outlets are often unable to tell a story that doesn’t fit within the established narrative. We must tell our own story. Social media afford us multiple outlets for the consciousness-raising that movements have always depended upon. Use them all. Engage in voter registration and education. The political power of fusion coalitions is based upon a diversified electorate that recognizes common interests. Extremists understand this. They have invested heavily in restricting voting rights and dividing potential allies. We must engage voters in each election, educating them about how candidates have voted or committed to vote on issues that are part of our shared moral agenda. Pursue a strong legal strategy. A moral movement rooted in constitutional values needs a strong legal team and a commitment to mobilizing in the courtroom. The future we imagine and embody in the streets must be established in our statehouses and affirmed by our courts. We cannot neglect this key piece of our common life. Engage the cultural arts. A moral movement is only as strong as the songs we sing together. Study the history of cultural arts in freedom movements and bring music, the spoken word, storytelling, and visual arts into your organizing. Make sure the images in your art and actions convey the same message you are proclaiming with words. Speak the truth, sing the truth, and use art to help people imagine the future they cannot yet see. Resist the “one moment” mentality; we are building a movement! No one victory will usher in beloved community; no single setback can stop us. We are building up a new world, moving forward together toward freedom and justice for all.